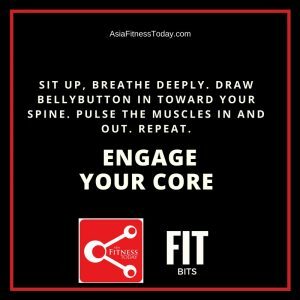 I’m sure you’ve heard fitness trainers saying this – engage your core, engage your core! Your “core” refers to the muscles that surround your midsection, the part that runs from the top of our pelvic bone to the top of your stomach, wrapping around to your lower back. Basically it’s your trunk area. Why does your “core” need to be strong? It needs to be not only strong, but also flexible and coordinated to help you in every action and movement. The core area helps us flex, extend, side-bend and rotate your trunk in all directions, as well as keep the trunk stable. Along with your hips and lower back, the abdominal muscles is crucial in keeping our centre strong so that we can use our arms and legs powerfully without hurting your spine. Why is core engagement important? A strong core is important in maintaining good physical health. Remember, your core is the building block for your entire body’s posture and overall movement. Once you have strong core muscles, you can improve your balance, coordination and stability, as well as reduce any risk of lower back pain and injury. Besides athletes and sportsmen, elderly persons can also greatly benefit from having a strong core. Incorporate practicing core engagement exercises so you can also build endurance around your other muscles. A very simple tip, is to ensure holding a good posture at all times. This simple practice naturally engages your core! So when you’re standing, your spine is more or less in its natural curve. Once you’re used to it, it will become second nature and standing with a relaxed core will actually feel weird. Six packs equal a strong core? Let’s start with aspiring towards a lean physique…without a six pack. Most people with six packs are truly inspiring and disciplined; keeping an extremely strict exercise regime and maintaining a planned nutritional schedule and intake. Often pictures of athletes or models parading their six packs are taken during their peak conditions where they have activated both their transverse and rectus abdominus. They don’t usually look like that all year round. In truth, this kind of lifestyle is not realistic for ordinary people like us who do not have 6-8 hours to exercise every day. Abdominal definition is, in many cases, a side effect of being strong and healthy. In other words, strengthen your Transverse Abdominus. Transverse Abdominus, or TVA, is the deepest layer of abdominal muscles. It covers our whole torso from ribs to pelvis and from front to back. The TVA muscles are set horizontally like a weight belt or corset and it does not move your pelvis or spine. It helps with your breathing and also helps stabilise your spine, in addition to forceful exhaling of air from the lungs and compress the internal organs. Why is the TVA so important as a core muscle? The TVA helps stabilise your spine and is one of the main muscles that helps stabilise the lumbar spine, which is the bottom part of the spine. You can tell you have a weak TVA when you have lower back pain. When you strengthen your TVA, you not only strengthen your back, which is important for many other activities such as lifting stuff, sitting, walking and many more activities that involve limb movements. When your TVA is weak your abdominal wall will bulge outwards and your pelvis may rotate and your may increase the risk of a curvature of the spine. In other words, strengthen your core to decrease the risk to your spine. It also helps you to trim your stomach area. How do you build on the TVA as a core muscle then? There’s no one magical exercise routine, but a combination of movements that engage the core in a way that works so much better than crunches and sit-ups. Planks are well known for “working” the core, but some other exercises include pull-ups, jumping, spinning, and rolling. These movements have one thing in common – and that is, none of them are “isolation” exercises. Basically, in order to do those movements, you need to use your abdominals to maintain your posture and stability throughout the motion. A lot of us sit for long periods of time either at the office or while driving. For this very reason, practising and engaging your core is especially important as you sit down or get up from your chair or car seat. Step 1: Sit up straight in your chair, with your shoulders over your hips, then let your back relax back against the backrest. Step 2: Sit up into your original position again and feel that light sense of tension in your abs needed to hold yourself up. It should not be much. Just a light, but deep, engagement. This is the level of engagement you want to have while you walk, run or do any movement throughout your day. Step 1: Sit up tall on a chair. Straighten your spine and place your feet flat on the floor. Step 2: Draw your bellybutton in toward your spine, engaging your core muscles. Do not hold your breath; instead breathe deeply and evenly. Step 3: Contract your abdominals or pulse the muscles in and out until your muscles fatigue. You can practice the abdominal vacuum exercise throughout the day while you are sitting on a chair. 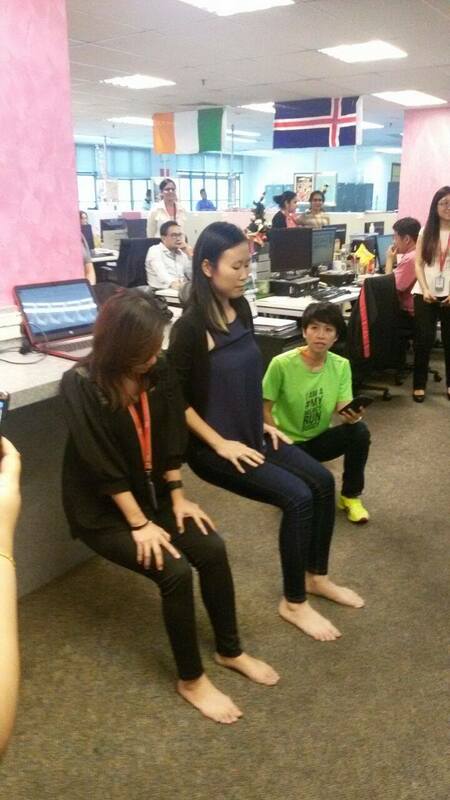 Step 1: Sit on the edge of a chair with a straight spine and your feet flat on the floor. Step 2: Place your palms flat on the seat of the chair, curling your fingers around the edge of the seat. Step 3: Engage your core muscles by drawing your bellybutton in toward your spine. Press down with your hands and draw your knees toward your chest, lifting your feet two to four inches off the floor. Repeat this exercise as many times as you can during a one-minute interval. How about other times when we are not sitting or exercising? Keep your core engaged lightly and gently during any and all movement: when you first get out of bed (with a gentle stretch), while walking, getting into and out of your car, at the office at your desk, and most definitely while you run or walk or do any kind of fitness activity, standing in line, cooking dinner, even while brushing your teeth. When you focus your mind on your core several times a day, you are in touch with a deeper part of yourself, in the present moment. Make it a game…how many muscles can you engage in any movement if your core is engaged. Feel the difference in how you move when your core is or is not consciously employed. How about setting an alarm on your phone, with a ring tone that is unique to remind yourself to engage your core? You might not think about something that happens so automatically as breathing, but it can make all the difference in your workout – especially when doing stomach exercises. Breathing out at the right time tightens your ab muscles and engages your core, so you get more out of your workout. Proper breathing technique can also give you more stamina while on the exercise mat. When exerting yourself, it can seem like a natural reaction to hold your breath. Don’t do this! Keep breathing otherwise you could get dizzy and faint. Improper breathing techniques could interfere or delay your ability to get the most out of your ab workout. To get the most oxygen from your lungs to your muscles, it’s important that you draw air deep into your lungs. This is accomplished using a technique known as abdominal breathing. Abdominal breathing helps you fill your belly with air to get the optimal amount of oxygen into your body. If you’re only pulling air into your chest, you may not get the oxygen you need during a workout. Ok, some people will say that they breathe with their lungs. This is okay as long as you can feel your abdominal muscles move. The problem arises when you use your upper chest to breath as this more often than not causes or makes chest pain worse. Chest breathing are shallow and rapid or fast breaths. This is a stress response and can lead to hyperventilation, which is bad for those with stress and anxiety. You can use abdominal breathing to control your nervous system and encourage your body to relax. When your body is relaxed, it brings a range of health benefits. 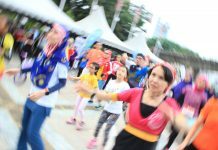 Take a quick at the last issue of Running Malaysia where we touched on Breathing. Proper breathing helps you to lose weight as well. So when you’re strengthening your core, don’t forget to breathe. 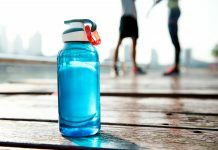 Credit: Article compiled by Nikki Yeo – Co-founder AsiaFitnessToday.com and ACE-certified Fitness Trainer.